Our most important asset in getting the word out about the benefits of belonging to Handbell Musicians of America is you, our current membership. In appreciation for your help in encouraging new handbell musicians to join the Guild, we are pleased to offer a membership referral program to reward you for your effort. For every new member you refer, you will earn valuable Handbell Bucks, which can be redeemed toward your own membership dues and event registration fees. 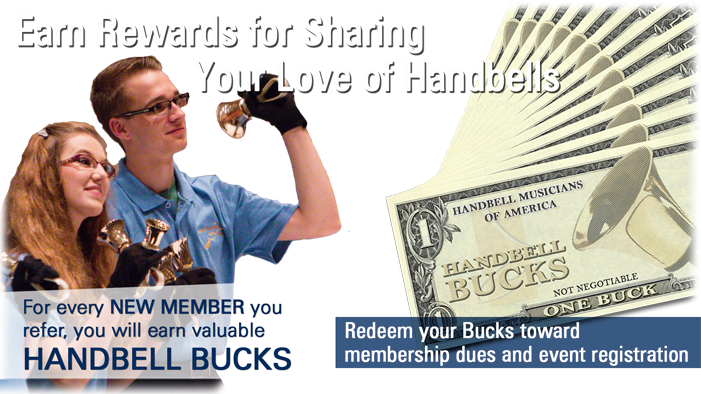 Handbell Bucks can only be earned for new Handbell Musician Memberships, HIC Memberships, or Retired Handbell Musicians Memberships that begin on or after January 1, 2015. The new membership must be completely new or from an account with a membership that has been lapsed for at least 24 months. The primary contact for a group membership cannot refer themselves for a new individual membership. Handbell Bucks can accumulate but will expire December 31, 2018, for any earned in 2016. Handbell Bucks are earned when the new membership is paid in full. If a new membership is cancelled prior to its one-year term, Handbell Bucks will be removed from the referring account. The member should contact their Regional Membership Coordinator (RMC) to request a coupon for a specific event or for membership renewal. The RMC will respond with a coupon code that will be valid only for that member’s account number and for a one-time use. The coupon code must be redeemed online through handbellmusicians.org and is only redeemable for the specific purpose requested by the member. The coupon will expire 30 days from the date of issue. If the coupon is not used in that 30-day time frame, the Handbell Bucks used to get the coupon will be returned to the member’s account balance. Handbell Bucks cannot be applied retroactively to previously processed renewals or event registrations. They must be applied at the time of registration or renewal. If the member’s account lapses for 60 days or more, all remaining Handbell Bucks on that member’s account will be forfeited.